You've invested a lot of time and money in getting just the right watersports and dive gear. 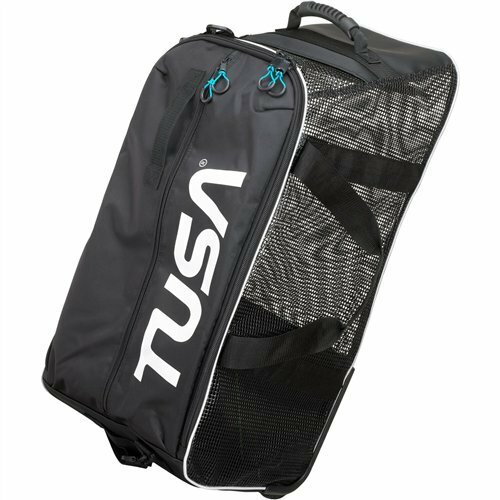 Now, protect it from mold and mildew with the TUSA Heavy Duty Large Diver's Mesh Roller Duffel with Solid Top Pocket. This bag is constructed of heavy duty plasticized mesh and woven nylon to allow for drainage and maximum ventilation. Reinforced corners and bottom panel ensure the bag holds its shape. The large main compartment can accommodate 1 complete set of warm or cold water scuba diving gear, or 2 sets of adult size snorkeling gear and wetsuits. Longer bottom panel ensures standard fins will fit. Top zippered pocket is solid, to hold travel documents and smaller items. Grab the side handle opposite the wheels and tip the bag onto to roll it smoothly along. Use the top handles, covered in a hook and loop wraparound sleeve, to carry the bag in one hand. Attach the adjustable shoulder strap for yet another way to carry this versatile bag. Dual zips make for quick, easy opening and closure.